IM-Magic Partition Resizer Server helps reallocate disk space in Windows Server 2003, SBS 2003 to make the best use of disk space with data and system protected. Raid supported! Download IM-Magic Partition Resizer Server for resizing disk space without disk formatting and os reinstalling on server os. Low disk space on hard drive means that the available disk space of a disk partition is not enough and users can no longer store data to this partition. If a data partition is running on low disk space, it won’t cause much trouble. You just need to transfer some data to another partition, delete unnecessary files or store data to another partition. However, if the system partition is running on low disk space, it can not only slow down your computer, but also cause a series of problem for your computer. Therefore, the only solution for system partition low disk space problem is to allocated unallocated disk space to extend system partition. In order to extend system partition to a proper size that can meet your need, you need to use partition software. IM-Magic Partition Resizer Server works perfectly on all Windows Server OS to extend, shrink and move disk partitions without moving or deleting files from the disk. As long as there is enough free disk space on the hard disk drive, you can extend the system partition to any size you want. 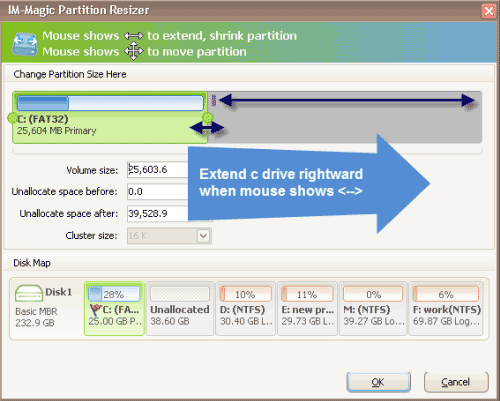 IM-Magic Partition Resizer Server can help with partition resizing only with several simple mouse clicks without rebooting your computer. Free download, install and launch the IM-Magic Partition Resizer Server on computer. 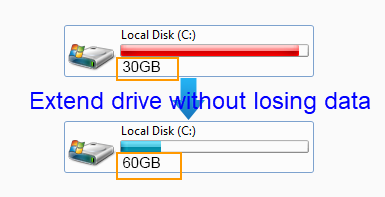 The software can show you the amount of available space on different partitions. Right click a partition that has enough free space and select " Resize/Move" option. When you see the mouse shows arrow symbol, you can shrink the selected partition to produce an unallocated volume. Move the unallocated volume close to system partition. Right click system partition and choose "Resize/Move" option. Increase the size of system partition when you see mouse shows arrow symbol. IM-Magic Partition Resizer Server is 100% safe for both data stored on disk and system. When the partition resizing is completed with the partition software, the data will still remain intact on the disk. If you stop the partition resizing manually before it is completed, the partitions can still remain the original state. If the partition resizing is stopped due to unexpected shut down of computer, all partitions can still remain original state when you reboot your computer. IM-Magic Partition Resizer Server is also an easy-to-use and free partition manager software for Windows Server. It has a clean interface, so you can know what to do clearly once you launch the software. Frankly speaking, Diskpart Command also enables users to extend disk partition. But if you are not a computer technician, you had better not use this command because it is not as simple as you imagine. If you make any mistake in the process, it may cause great disaster. In addition, if you want to run Diskpart command to extend a disk partition, it requires a free volume right close to the disk partition you want to extend. In another word, if the free volume is not close to the partition you want to extend, you are unable to move the free space to the partition with Diskpart command. In conclusion, if you are a computer expert who is quite familiar with Server OS and there is an unallocated volume right near to the partition you want to extend, you may run Diskpart command to resize the partition. If you just want to look for a simple and safe method to resize partition, a third-party partition resizer like IM-Magic Partition Resizer is always the best choice.